Music generally doesn’t only consist of a long stream of only notes. Music also needs some rests. How do we write rests? As with notes, rests have durations, you can have short rests and longer rests. The equivalents of the whole note, half note and quarter note are the whole rest, the half rest and the quarter rest. The whole rest has, like the whole tone, a duration of 4 beats. The half rest has, like the half tone, a duration of 2 beats. And, as you might have guessed already, the quarter rest has a duration of 1 beat. And, you might not be surprised when I tell you that the sixteenth rest, with duration of a quarter beat, can be written as the eighth rest with an extra flag (see below). Like was the case with the sixteenth note. 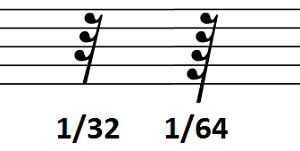 By adding more flags, we can make thirty-second rests and sixty-fourth rests (see below). Those very short rests are not often used. To give you an idea of rests in music, listen to the examples below and compare them with their corresponding staffs. All the sound samples start with a metronome that counts 4 beats before the rhythm on the staff begins. I will start with simple examples, and then make them gradually more difficult. At this point, it’s a good time to combine different note and rest durations with different notes on the treble clef. Let’s again start with a simple example and again gradually increase the level of difficulty. Perhaps that this last example was a bit difficult to follow. In the video below, I explain exactly how you can deal with difficult rhythms that you can come across when reading sheet music. This 7 minute video is an extract from a video in my online piano course “How to play the piano or keyboard from scratch“. It explains how to play notes that are not exactly on the beat, but in between two beats. This is illustrated with the verse and chorus of the song ‘Let it be’ from the Beatles. In the video, you will see measures (or bars), a 4 quarter time signature, and a pickup in the beginning of the chorus and the verse. You don’t need to know what this all is to be able to follow the video. To fully master rests and notes, it’s important to practice regularly. Be sure to do the exercise in the link below. Did you appreciate this lesson? What do you think of the video? Please leave a comment below and let us know.